Turkey's President Recep Tayyip Erdogan has been criticised for showing some of the New Zealand mosque gunman's video to bolster support at election rallies. New Zealand Foreign Minister Winston Peters told Turkish officials showing the video was "unfair" and endangered his country's citizens abroad. Friday's attack on two mosques in Christchurch left 50 people dead. The attacker live-streamed video of the killings and it was widely shared and downloaded as social media firms raced to take the footage down. In New Zealand the footage has been classified as an objectionable publication and it is an offence to distribute or possess it. Why did Mr Erdogan show the video? Sunday's rallies were aimed at galvanising support among his conservative power base ahead of a local election at the end of this month. The prime motive was to condemn global Islamophobia - along with the West's response to it - and to criticise political opponents inside Turkey as weak. Mr Erdogan pointed to specific mentions of Turkey by the suspect in his manifesto. 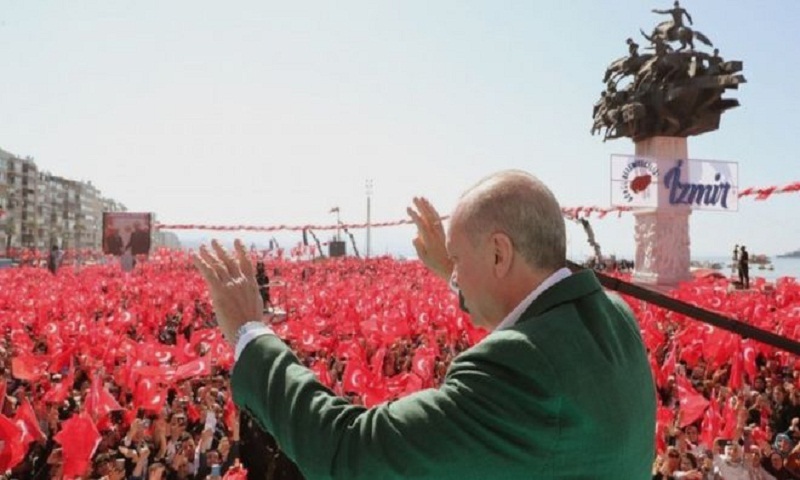 Mr Erdogan told a rally in Gaziantep: "What does it say? That we shouldn't go west of the Bosporus, meaning Europe. Otherwise, he would come to Istanbul, kill us all, drive us out of our land." Semi-blurred footage of part of the mosque attack was shown on screens at at least three rallies, along with extracts said to be from the online manifesto. Mr Erdogan also criticised the leader of Turkey's main opposition CHP party, Kemal Kilicdaroglu, showing a clip of him talking about "terrorism rooted in the Islamic world".